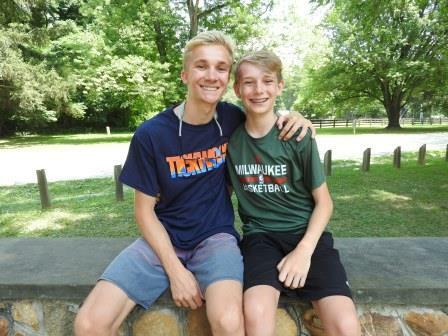 Recognizing that high school students can get more out of a summer camp program, YMCA Camp Tockwogh’s Leader in Training program is centered on building skills for teens. Teens learn through daily leadership workshops, a hiking trip, and shadowing staff while working together on a variety of projects. Our staff and Leader in Training participants form a mentoring relationship- providing feedback and insight into their efforts on the different tasks they take on. Every year, former LIT’s highlight their experience in college essays and interviews. High school performance is obviously important in the college application process; so are the intangibles and programs outside the school environment. This program provides our campers the chance to learn real interpersonal skills that will serve them well for the rest of their lives. The program is centered on teamwork and interaction, building relationships between new and returning campers. There is so much interaction with peers and staff our LIT’s find themselves a welcomed part of the group within the first few days. What will follow is a month of some of the most memorable and formative experiences in their life. LIT applications are accepted throughout the year, though it is highly recommended that they are sent in early as spaces are limited. The application process consists of a written application, 2 written references, and an interview. Program Cost: $2,835 2019 rate. In addition to Leadership Camps and training programs, Tockwogh offers Camp Counselor Training here.